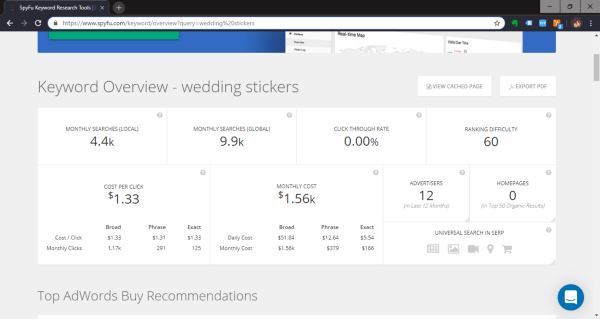 I came across WeddingStickers.com on Flippa.com yesterday while poking around the interweb for Sully. A two-word generic dotcom in what I assumed to be a popular niche certainly turned my head. But does it have traffic? StatShow estimated about 30 visitors a month but no-one else (Similarweb, VisitorsDetective, TrafficEstimate, Alexa nor SiteWorthTraffic) agreed. Sometimes these traffic estimates are rubbery. If you’re not the New York Times then they may not even bother showing any data. However, this is a major downer. 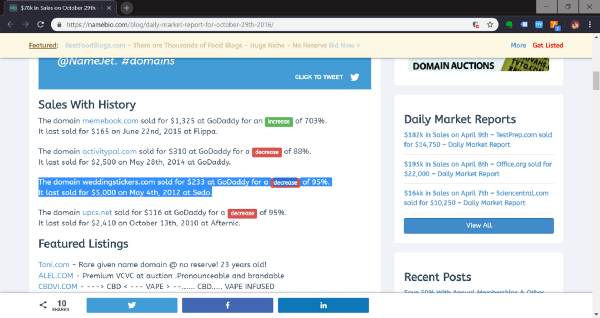 If the domain does not have reliable, third-party, verifiable stats then I’ve got one foot out of the door. Does it get typo traffic? VERDICT = No typo traffic. 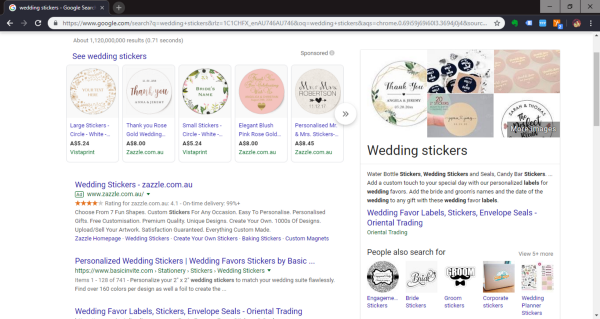 The adjacent extensions (.net and .org) for the singular and plural of “wedding sticker(s)” doesn’t appear to be functioning websites. 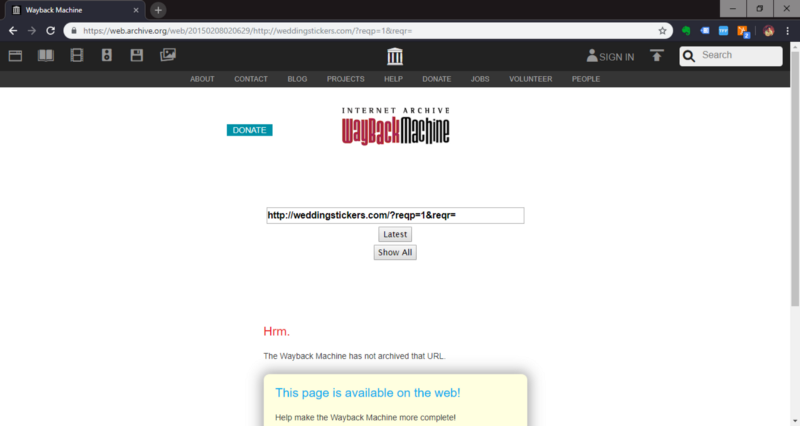 No one will be accidentally typing in weddingstickers.com looking for them. How was the domain used in the past? 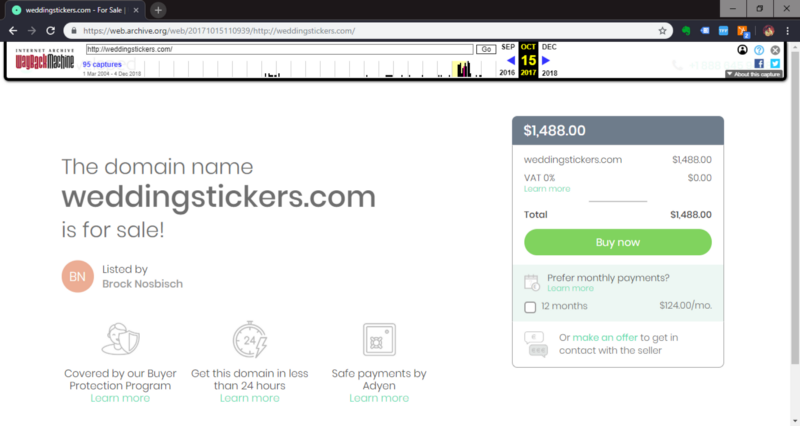 According to Namebio, the domain weddingstickers.com sold in 2016 for $233 at GoDaddy for a decrease of 95%. It previously sold for $5,000 on May 4th, 2012 at Sedo. A quick peek at Archive.org indicates the domain name probably wasn’t developed. VERDICT = No tested business model. No-one has made a meaningful dollar on this domain name in the past. It has never been used to sell a product or service. It’s even managed to lose money for at least one unlucky owner. Is it worthwhile developing the domain name? 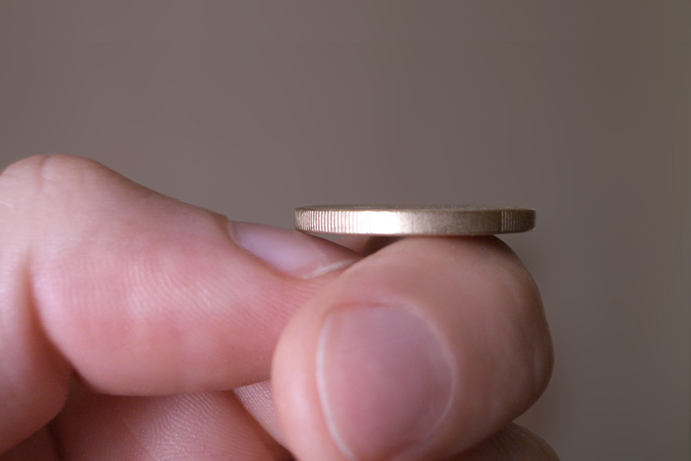 Spyfu estimates about ten thousand searches per month globally at a $1.33 cost per click. Seems a little low for the wedding niche. Perhaps it’s not something a lot of people search for. I can’t say I had stickers at my wedding. Maybe it’s not the premium product most people associate with getting married, like wedding photographers and venue hire. A Google search reveals Zazzle, LightInTheBox and WeddingStar are the highest ranked advertisers. Whilst not Amazon, they are corporate-sized competitors that have pockets to match. They won’t be easily dominated. Is it a growing niche? Are wedding stickers the new, new thing? 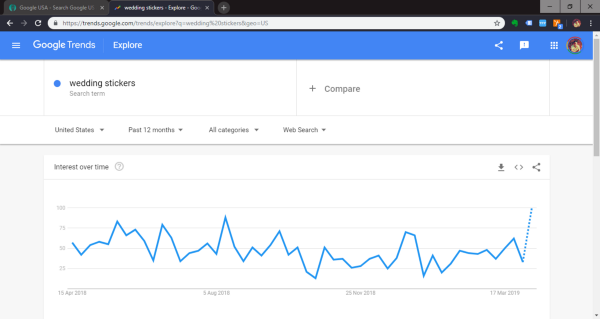 Google Trends seems to indicate wedding stickers aren’t quite having their ‘moment’ quite yet. VERDICT = Low value-low growth niche with decent competitors. You’d need to sell a lot of stickers. And it won’t be a cakewalk competing against Zazzle and WeddingStar. They are established players. 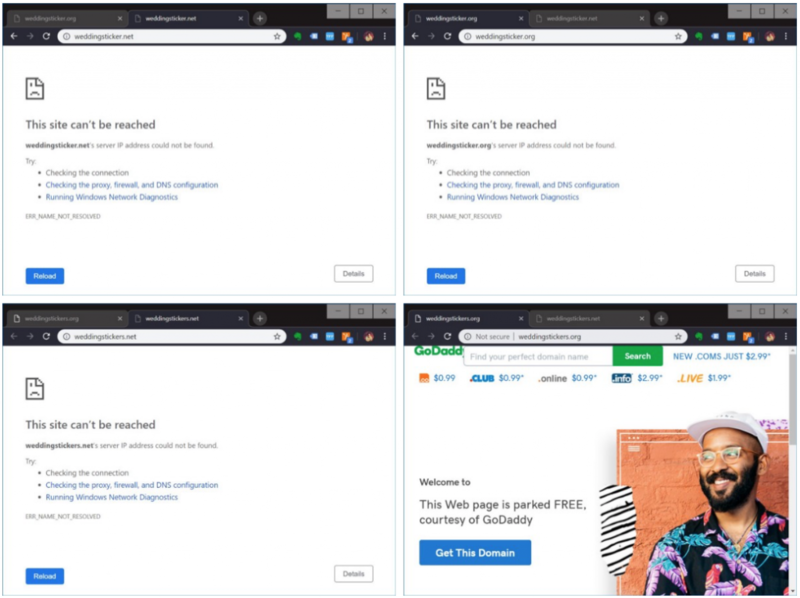 Even if you were able to SEO and rank higher without having to pay for clicks, you would still have to have support processes and logistics for a physical product (albeit a low complexity one). Not quite the diseased rhinoceros pizzle, I’d still be tempted (at a $600 BIN) but for the flat Google Trend line. This, along with zero baked-in traffic means you’re up against it from the get-go. A domain name should be making it easier for a business to attract, convert and retain recurring profitable customers. This one does not. Worried that he had pissed away the best years of his professional life and never getting around to doing that web startup thing he pencilled in his Bucket List, Jon Yau spent $250,000 on a domain name, quit his job and now runs Stockphoto.com full time. You can read more about his adventures at blog.stockphoto.com. Read his original interview on Sully’s Blog. This is definitely a usable domain, but it doesn’t represent a primary product. This is more of a secondary product that is offered vs a product that an entire company is built around. Fair call, Brad. I can see that it would have customer brand recall if it was the category name. 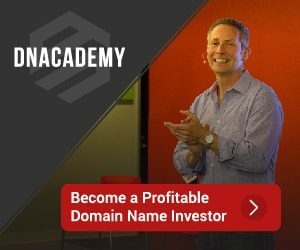 You’re completely correct – it was my assumption that the domain name would be evaluated on the basis that it would be a standalone proposition. Great run down. 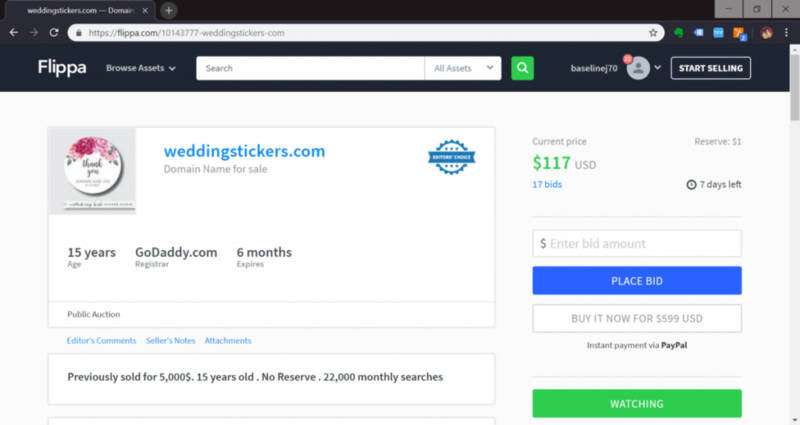 My initial reaction was “wtf are wedding stickers?” so that’s all i needed to know about the quality of this domain name. Just so it is clear, the Undeveloped screenshot shows that I used to own the domain. I sold it earlier this year. 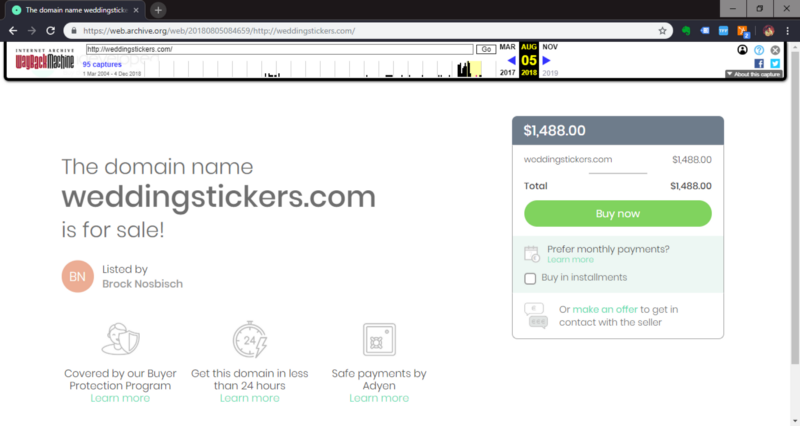 Out of interest, did you ever try monetising the domain in any way?